The internet can be a great resource for shoppers looking to expand their choices of products to buy and is an invaluable way to save money. Online stores are highly competitive, not only with other online stores, but also with brick-and-mortar competitors. Price-comparison websites make deal hunting easier and also help guide shoppers to online stores with the best reputations by posting reviews submitted by other shoppers. Point-of-sale advantages include stores offering no shipping charges and free ship-to-store options. A lot of online stores do not pass on sales tax (unless required by the state) to customers, which can add up to substantial savings for those shoppers who buy primarily online. The stores are almost never closed. Shoppers can shop in their pajamas. 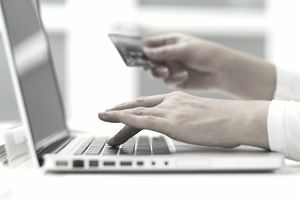 Online shoppers save on gas. There are no annoying crowds. Many online retailers allow shoppers to post reviews about the products that they purchased. There are more choices for buying refurbished products. Online sales representatives often receive more intensive product training than those at the local stores. Online sales representatives often have more flexibility with making decisions such as applying coupons, meeting competitors' prices and expediting shipping at no extra charge. Sometimes a deal that looks great falls short of what has been advertised. Communicating dissatisfaction can be difficult online and often takes enormous patience and tenacity to achieve satisfaction. Problem-solving face-to-face with local store employees is often faster and more satisfying. Contacting the next level of management is much easier at local stores than online. Online shoppers sometimes lose the power to negotiate the price and payment terms that may exist in local stores. Items ordered online are sometimes back-ordered, but shoppers may not find out until weeks later. This is particularly problematic when buying gifts. Online shoppers do not always know if a site is a legitimate retail store and if is safe to shop. Restocking and shipping costs are often charged on returns. Online shoppers often do not have a person (or the same person) to talk to when dealing with a problem. It is sometimes easier to get money refunded locally when the item purchased drops in price within the guaranteed price period. Online shoppers do not get to take advantage of seasonal statewide tax-free shopping events. Pros: Many online stores sell products at really low prices because of the lack of money spent on overhead. Local stores have operating costs like rent, staffing, water, heat, and air that are figured, at least partially, into the markup of the products. Cons: Online stores advertising free products will sometimes increase the cost of shipping so that they profit from the purchase. For example, shoppers may get three free software programs, but paying $14.95 in shipping or handling charges is higher than what would normally be charged and likely covers the cost of the three items plus shipping. Shoppers will save money and frustration by taking the time to learn the policies of both online and local stores before making a purchase. Sometimes there are hidden charges like restocking fees at some online and local stores. The restocking fee may increase the longer it takes the shopper to return an item. Since it takes longer to ship a product back to an online store than it does to return it to a local shop, this might be the deciding factor on where to make the purchase. The small print on return policies will sometimes state that shoppers must pay to ship products back, even when items arrive with a defect. It is also not uncommon for online stores to deduct the original cost of shipping the product from the return invoice. If a shopper is uncertain of a purchase they are making, knowing the return policy of the online store might affect their decision to shop locally instead. Another point to consider is how repairs are handled on the products being purchased. It might be easier to return a faulty product to the local store for repair, rather than going through the trouble and expense of shipping it back to an online store. Reading the customer service policies online and at local stores should provide shoppers with clear answers on all fees and guarantees. If a store's policies are vague and employees seem uninformed, shoppers may want to shop elsewhere.